Rated 4.6 out of 5 based on 39 reviews. 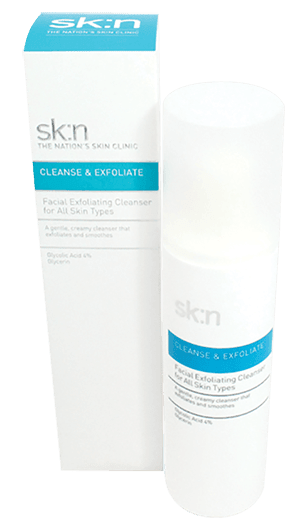 sk:n Facial Exfoliating Cleanser for all Skin Types is a gentle creamy cleanser, containing glycolic acid and glycerine to remove dead skin cells, clear pores, moisturise and rejuvenate the skin. Exfoliation is the technique of removing the top layer of mostly dead, epidermal cells on the outer surface of the skin to expose fresher brighter skin. It leaves the skin in perfect condition to maximise the effects of follow-on products. 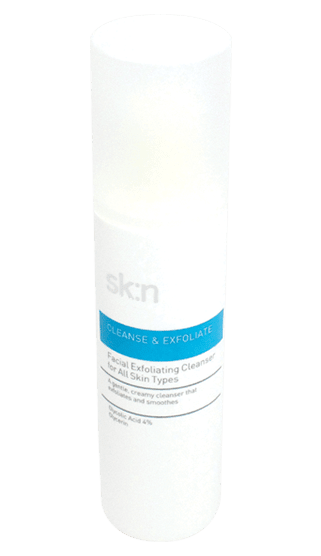 While sk:n Facial Exfoliating Cleanser for all Skin Types is not specifically for oily skin types, exfoliating products are helfpul in tackling oily skin, as exfoliation can temporarily reduce the amount of oil on the skin. Glycerine – widely used in skincare for its renowned moisturising properties. They accelerate the body’s natural exfoliation process. They stimulate the production of collagen. This is especially important for oily and acne-prone skin as AHAs help eliminate trapped oil and dirt that create acne. Best used in the evening by massaging a small amount into the face, then rinsing with water. Take care to avoid the eyes. However, if there is contact with the eyes then rinse them immediately with water. Not to be used on inflamed, irritated skin, particularly after sun exposure. Due to the exfoliating nature of glycolic acid, it is possible a temporary tingling sensation might be experienced upon application. Leaves my skin feeling super clean. Quite pricey but worth it. In combination with Anti Blemish moisturiser, Aloe Vera gel, Vitamin B and Evening Primrose supplements, this product had really helped to transform my daughter’s skin. You do have to be patient - it’s taken about 6 weeks of religiously using the products to see a change.